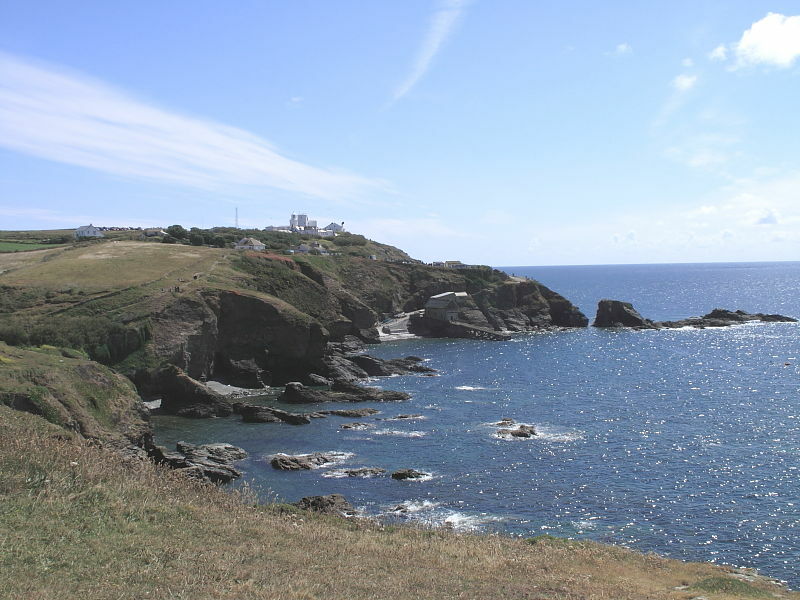 Lizard Point is a major tourist attraction being the most southerly point in the UK. Due to this prominent position at the tip of the Lizard Peninsular, offering far reaching sea views, it is also one of the best places to see marine wildlife in Cornwall. 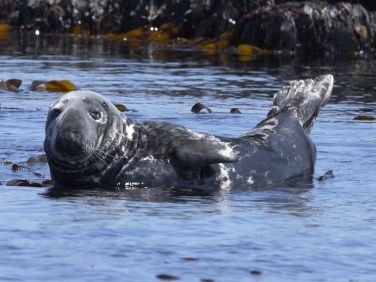 Dolphins, Porpoises, Basking Shark, Seals and large numbers of seabirds are sighted annually. And the presence of Cornish Chough on the cliffs is also a fantastic bonus. A large National Trust car park is located off Lighthouse Road. Click on the image to enlarge the National Trust map shown left. 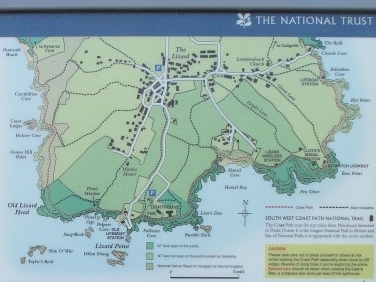 From here visitors can walk the short distance south to the South West Coast Path and Lizard Point or follow the paths east to the Youth Hostel and lighthouse. Toilets with disabled facilities are located in the car park. Cafes and souvenir shops can be found on the point. The South West Coast Path closely follows the cliff tops around Lizard Point. From almost anywhere along it there are sensational views over the sea. 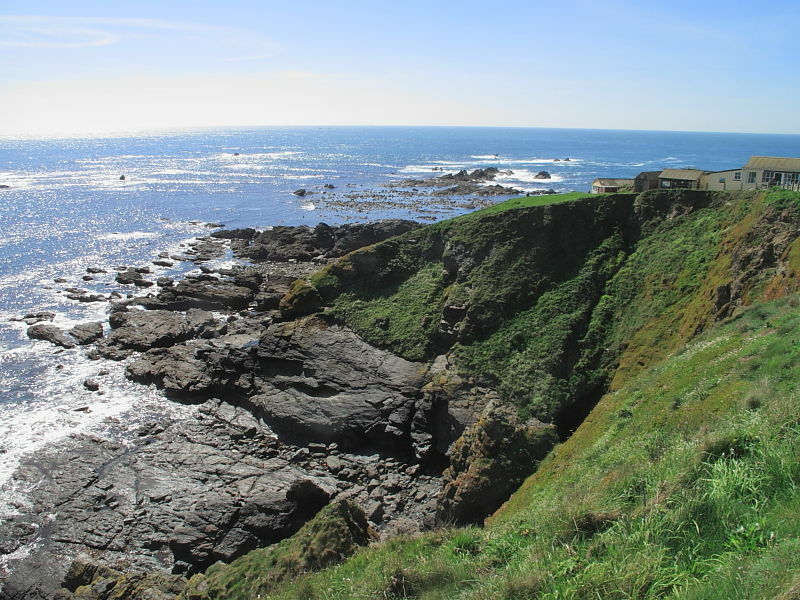 Sightings of dolphins, Basking Shark and Grey Seals have been made from all along this part of Lizard coastline. Visitors can even indulge in a Cornish Pasty from UK’s most southerly café at the same time as staring out over the waters. 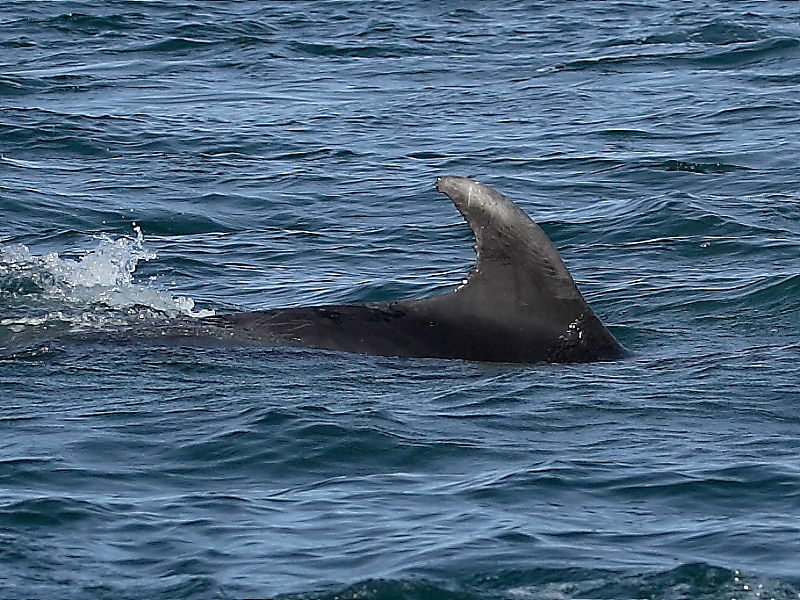 Bottlenose and Common Dolphin are the most likely species to be seen and can show up at any time of the year. 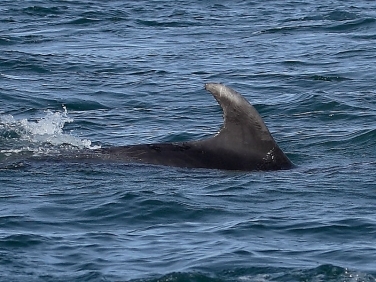 Risso’s Dolphin and the smaller Harbour Porpoise are recorded in smaller numbers annually. The appearance of dolphins is unpredictable. Grey Seals can be seen throughout the year in small numbers all around the Lizard coastline. They can often be seen in the shallow water around the little harbour at Lizard Point and on exposed rocks a little to the west. When lying out on rocks they can be surprisingly difficult to see and scanning with a pair of binoculars is recommended. Gulls, Fulmars, Cormorants, Gannets, Shags, Guillemots, Razorbills and Kittiwakes can be seen throughout the year with some species nesting on the cliffs. Many passage seabirds can be seen passing particularly during the autumn passage. 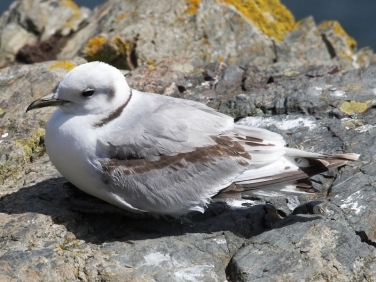 During onshore gales many rarer species such as Skuas, Shearwaters, Petrels and Auks may be pushed close to Lizard Point. Since the Choughs recolonisation of Cornwall in 2002, a pair have been commonly seen around the cliff tops and feeding in nearby fields. This pioneering pair have since been successful in rearing several broods and these are slowly spreading to other parts of Cornwall. 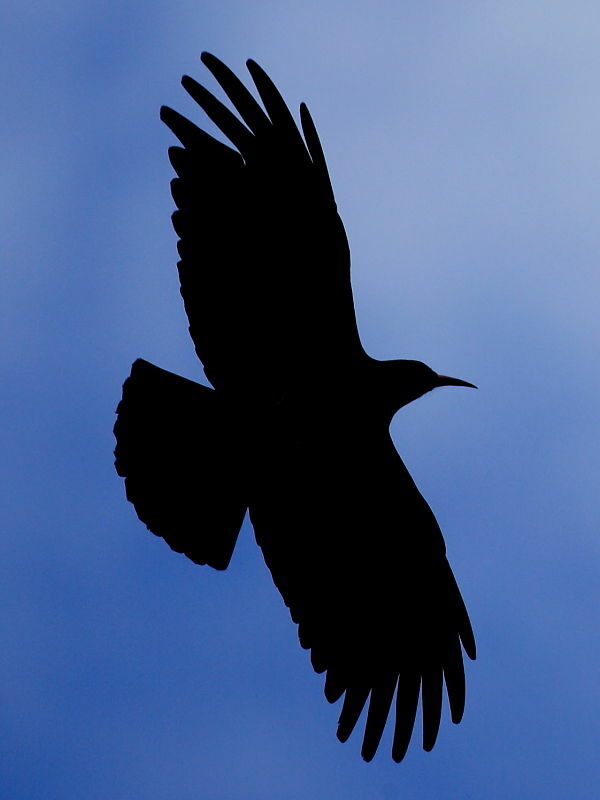 It’s great news that the distinctive call of Chough can once again be heard over parts of the Cornish coastline. Further information can be obtained from the RSPB volunteers seen on the cliffs during the breeding season keeping watch on the Chough. The RSPB monitor the Choughs throughout Cornwall and would welcome any sightings from visitors. Any information on coloured leg rings present on birds would be particularly useful.